Arcanum’s Austin Baker bounces a pass past Ansonia defenders during a boys basketball scrimmage on Wednesday in Arcanum. ARCANUM – Arcanum played host to a three-team varsity boys basketball scrimmage on Wednesday with Ansonia and National Trail. For the host Trojans it was the continuation of an already busy summer as they spent a couple days in Bluffton for a shootout and hosted Tippecanoe and Troy Christian in a scrimmage last week. Wednesday’s scrimmage featured 10-minute periods. Each team played the other two opponents three times each, giving each squad six 10-minute periods to play. 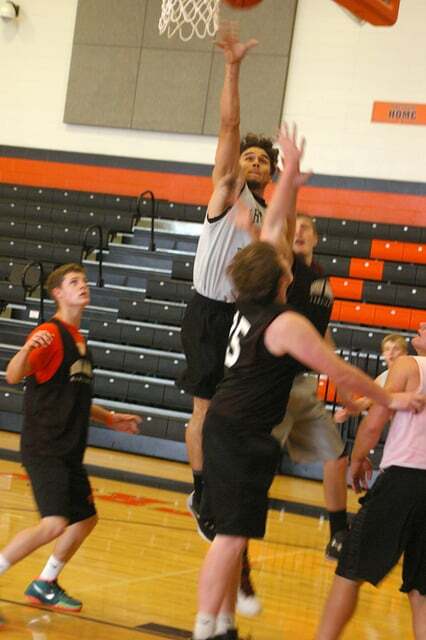 Ansonia finished with the best record on the day, winning four games and losing two. National Trail won three and lost three while Arcanum won two and lost four. In the day’s first scrimmage, Ansonia beat National Trail 11-10. National Trail then beat Arcanum 11-7. Then Ansonia beat Arcanum 10-9. In the second go-around, National Trail handed Ansonia’s its first loss of the day, 10-2. Arcanum then recorded its first win with a 12-2 victory against National Trail. Then Ansonia beat Arcanum 13-10. In the final round of matchups Ansonia beat National Trail 19-8. National Trail then beat Arcanum 15-13. In the day’s final game Arcanum beat Ansonia 7-6.